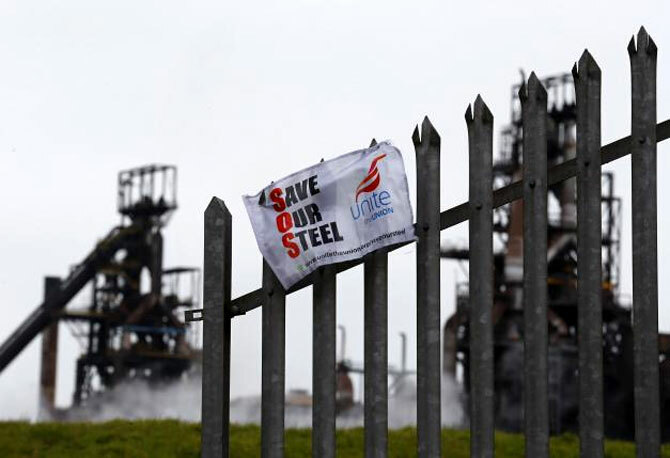 The UK government on Thursday announced it is willing to acquire 25 per cent minority equity stake in Tata Steel's UK operations as well as offer "hundreds of millions of pounds" in debt relief to rescue the troubled Indian steel giant by helping potential buyers. UK business secretary Sajid Javid said the financial package, being jointly worked out by the UK and Welsh governments, said the government was "working closely with Tata Steel UK on its process to find a credible buyer". "We would work alongside a potential buyer to make sure that the government is doing what it could to support a viable sale," British Prime Minister David Cameron's spokesperson said at a media briefing. "If we were to take an extra stake it would be a minority one with the aim of supporting the purchaser in delivering a long-term future for the business, we are certainly not seeking to be controlling the company," said the spokesperson. Dismissing the move being perceived as part-nationalisation of the steel industry in the UK, she added: "I am not sure (if) we would accept the concept of part-nationalisation. We will be investing on a commercial basis. "We would not see this as nationalisation. We would not be seeking to acquire a control in the business. We don't think that nationalisation is the right answer." Besides a minority stake, the UK and Welsh governments are considering additional grant funding, which could involve support for the development of power plant infrastructure, energy efficiency and environmental protection measures, R&D and training. The government also said it was working with the pension scheme trustees of Tata Steel and British Steel to minimise any pension impact on the purchaser. "This government is committed to supporting the steel industry to secure a long-term viable future and we are working closely with Tata Steel UK on its process to find a credible buyer. "The detail of our commercial funding offer is clear evidence of the extent of that commitment," said Javid, who had earlier this month rushed to Mumbai for talks with Tata Steel officials. "Ministers have visited Tata Steel sites across the country and the pride and dedication of the highly skilled men and women working there is obvious to see. "We have already delivered on energy compensation, on tackling unfair trading practices and on procurement of British steel, and we will keep on going further to support this vital industry," he added. Britain's biggest steelmaker earlier this year announced thousands of job cuts as part of its broader cost-reduction plan for its business amid "unfair" steel imports from China. The proposed changes followed continued falls in the European steel price caused by a flood of cheap imports, particularly from China, the company had said. The Department for Business, Innovation and Skills has said the offer would be tailored to the purchaser's strategy and financing needs. So far, two potential buyers are seen as frontrunners – one is Indian-origin businessman Sanjeev Gupta's Liberty House and the other is a management buyout being spearheaded by Stuart Wilkie, managing director of Tata Strip Products UK. Carwyn Jones, the first minister of Wales, said: "We're committed to supporting any credible bid to secure steel-making in Wales. "We have worked with the UK government to put in place this significant package of support and we believe that this will help secure a successful sale of Tata Steel's operations in Wales and the rest of the UK." Meanwhile, further details emerged today of Tata Steel UK's current management team's plan to acquire the business. They have set up a consortium which represents workers, managers, customers, Neath Port Talbot Council and includes economists along with tycoon Sir Terry Matthews, who is chairman of Swansea Bay City Region. It met for the first time on Monday and again today. The team's rescue plan reportedly centres around keeping the blast furnaces going, in contrast to a plan drafted by Liberty House of moving towards electric furnaces. Tata Steel employs 15,000 workers in the UK across plants in Port Talbot, Rotherham, Corby, Shotton and Teesside. The company decided to exit its UK business last month after suffering losses of up to 1 million pounds a day. The Tata Group has set May 28 as deadline to find buyers and said over 190 potential investors have been approached about purchasing the business but kept the details confidential.